People get piercings every single day and, for the most part, they’re basic body piercings that don’t require a ton of aftercare. However, you do need to be vigilant and smart about your aftercare routine in the days following your piercing appointment up until it is fully healed. There are many products out there designed to be used for areas that were just pierced but at Almost Famous Body Piercing, we choose a more natural approach to our aftercare. Any time you are pierced with us, we cover which aftercare routine is best for the piercing you just received, and send you home with the products needed to care for your healing piercing wound. Natural disinfectants can help keep your new piercing from becoming uncomfortable, or worse, infected. 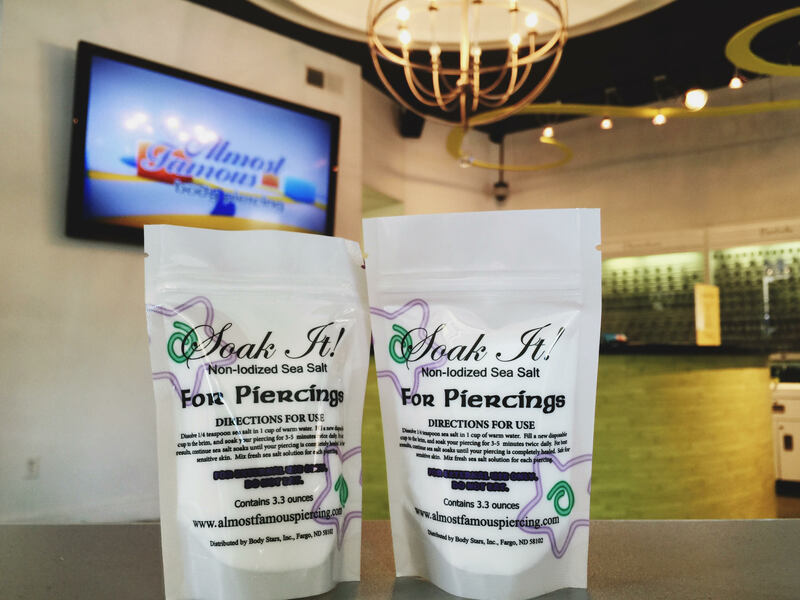 Saline solutions designed to be used for piercing aftercare are often recommended by reputable body piercing shops. Knowing which ones are actually effective for piercings can be a little difficult though. When you’re shopping for saline solutions, go for something designed to be used for body piercings specifically. You may pay a dollar or two more for these products because they’re made for a specialized market, but for most customers, they’re worth it for the peace of mind they provide. Saline solutions often come in spray form. These can be used when in a hurry but are not to be used in place of the soaking method. They spray is only reaching the outside portion of the piercing and not cleaning throughout. It’s necessary to use something that will ‘flush’ out the piercing and remove any drainage and residues from body products. Soaking your piercing two to three times per day with a small amount of non-iodized sea salt mixed in with warm water is a very thorough form of cleaning. The other benefits of soaking with a warm solution is that it encourages an increase of circulation to the area, softens any dried wound discharge, and helps the wound drain, which decreases inflammation. When soaking, you want to make sure the entire piercing is submerged and soaking. Glycerin soap and sea salt soaks go hand in hand. The sea salt soaks clean the inside of the piercing, and soften any drainage or ‘crust’ around the jewelry. 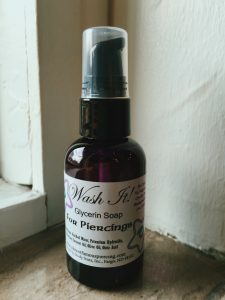 The glycerin soap is used on the surface of the piercing or the skin only. Our ‘Wash It!’ glycerin soap does not contain any dyes, fragrances, or animal products. It won’t irritate your skin or your new piercing. You can use a couple pumps at a time, work the soap into a lather using a little bit of water, and work it around the piercing. This will clean off any makeup, facewash residues, and drainage. Visit Almost Famous Body Piercing online to learn more about our piercing shops and for tips on body piercing aftercare. Almost Famous can also help you with a wide variety of body jewelry and body piercings, from basic ear piercings to more complex, unique placements.